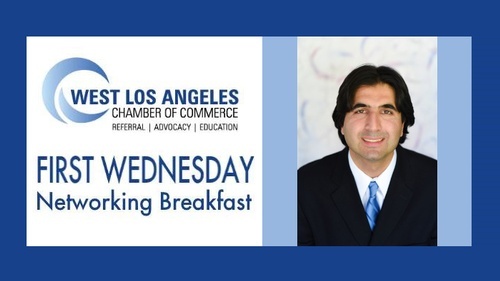 This Month Chamber Member, Director/Producer/Writer Armin Nasseri will be speaking on the process of making a film, and what it can mean for local businesses. Armin will be showing the trailer for his new film, and there will also be a special invitation for Chamber members to the World Premier of "The Carting Call," and to the after party, which follows immediately at Delphi Greek Restaurant and Bar. Armin will also be discussing his next film project, "A Differerent Class." Chamber members will be invited to participate in the development of the new film and will be offered exclusive perks for helping. Producer/Publicist Matt Chassin, as well as members of cast and crew of both films will be on hand to answer any questions individually. The West Los Angeles Chamber is dedicated to providing opportunities for business owners to interact with each other as well as leaders in the community. We believe that it is important to develop relationships with like-minded business owners with the intention of helping each other succeed. This is one of the best ways to grow your business, even in this day and age of online technology. Nothing can replace an in-person interaction, the shaking of someone’s hand. Bring plenty of business cards and have your 1-minute pitch ready! You will have the opportunity to share your business during our rounds of table networking.